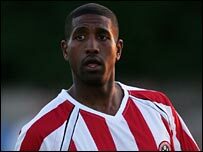 Queens Park Rangers have signed Sheffield United midfield man Mikele Leigertwood in a £900,000 deal, reports BBC Radio Sheffield. The 24-year-old joined the Blades last summer but struggled to hold down a regular first team place. He arrived at Bramall Lane from Crystal Palace after a £600,000 development compensation package was agreed. Leigertwood's versatility will appeal to QPR boss John Gregory as he builds his squad.